Have you ever wondered (or possibly experienced), what it would be like to have your brand name lost to your competition and never return? Maybe it was even lost to some cheap copy of your brand, just because you were not able to capture the attention of the searcher by not securing the top position within the search engine results page (SERP)? Advertisers are constantly looking for creative ways to attract and bring searchers to their websites to gain new customers and increase overall sales. So you need to ask yourself: are you doing enough to protect your brand in relation to Pay Per Click Advertising? 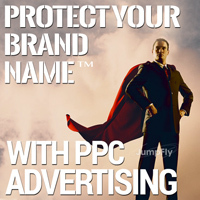 A popular discussion usually arises when discussing PPC advertising strategies for brand names. Should companies bid on their own brand name? Some critics believe focusing on the brand name for PPC advertisement is a waste of advertising budget. But I ask you this, if you feel that relying on your organic results are enough to protect your name, are two ads better than one, or possibly none? What if your brand is not listed organically in the top position or even on the first page ? Failing to bid on your branded name will leave the ad space wide open for your competition. Many crafty advertisers will create a competitor Ad Group, and will include keywords of every name of their direct competition in all match types to ensure their ads are displayed when someone searches those branded keywords. Failing to bid on your own brand name keyword phrases may allow competitors to place ads in a higher position than your organic or natural results. If you have a strong organic presence for your own name and you add a PPC campaign as well, you should dominate the entire page. This will leave little room for your competitors to gain any real estate and exposure. Research has shown that searchers expect respectable organizations to come up in the top results of Google, Bing, or Yahoo SERPs. If your company or website is new and your brand name does not have a strong organic presence yet – a well crafted PPC campaign can get your company’s brand name placed in the #1 position tomorrow. From a bidding perspective, branded keywords within a PPC campaign are usually the least costly of all keywords. They will also increase your quality score by a higher click through rate (CTR), ad relevance, and better landing page experience. A well-designed PPC campaign provides your brand the right exposure and helps contribute to your SERP ranking, with paid and organic results. Moreover, it ensures your customers are not lost to copycat brands. The easiest sales should be the ones you make when someone is actually searching for your brand name or company. To ensure they find you online, it’s important to make sure you are making it as easy as you possibly can for them to find you; that includes not allowing your competition to steal your customers. While there are many factors to consider when developing these campaigns, there’s something more to consider if your company provides a service or a product. What is the total dollar value you place on that customer as a life-long client? Once that customer commits to purchasing from you, they will likely look for your brand name to find your company online again. If your brand name is not easily found, they might end up clicking on one of your competitor’s ads, therefore losing the lifetime value of that customer. The bottom line is that bidding on your branded name keywords is your best defense against brand name advertising customer theft. So while advertising on your brand name might be an addition to your budget, it certainly is not a waste. We are not seeking just anyone. We are seeking the best. By working with us, you will be surrounded by the most knowledgeable and experienced PPC team in the industry, and we hope you are no exception. We fully understand that our business is only as good as our team, and therefore we take care of our valued staff like family, and expect the same in return. We are looking for someone with a long term, career oriented mindset, and a love for Google AdWords, Yahoo! Search Marketing and Microsoft adCenter. JumpFly is independently ranked #1 in the USA for PPC account management, and proudly maintaining this title since January 2008. Our rapidly growing company is solely focused on making sure our clients earn the best results available for their advertising budget for as long as they choose to work with us. We pride ourselves on maintaining the highest level of knowledge, professionalism, and integrity available to serve our clients the best we can at all times. JumpFly maintains a casual, relaxed and fun working environment. Hats, jeans and t-shirts are the norm. However, JumpFly is also filled with very proud, highly intelligent professionals who work very hard and enjoy reaping the benefits of their efforts. We keep very busy, and always have a “get it done” attitude each and every day. JumpFly does not allow personal calls, personal email, or casually surfing the net while at your desk. We are focused on productivity and efficiency which in turn affords the benefits associated with this environment. We treat our team with great care and respect, allow flexible working hours, and offer endless opportunity to grow and earn based on performance. We are currently seeking a highly motivated, intelligent, hard-working individual with high level PPC Advertising management experience to fill a PPC Account Executive role. If you are new to PPC, please do not apply for this position. We are now adding to a very tight knit team of professionals looking to lead a booming industry for years to come. After evaluation and proper training, this position is responsible for all aspects of the client relationship, and will serve as the direct contact at JumpFly for assigned clients. As the client’s direct point of contact the account manager is expected to professionally represent JumpFly and be responsible to quickly resolve any issues, concerns or changes that become necessary over time. Daily activities will include new client evaluations and setup, dealing with ongoing client issues, managing client expectations, ongoing keyword research and analysis, writing, analyzing and updating effective ad copy, maintaining desired budgets, strategic account analysis to determine appropriate changes to achieve better results, staying on the cutting edge of industry knowledge and much more. This is a high level position, and is unmatched in terms of potential for the right go-getter looking to constantly learn and improve. Your contributions to JumpFly will be recognized and you will be compensated accordingly throughout your career. If you desire to get in early with a rapidly growing company on the cutting edge of the advertising industry, we may be looking for you. If you are interested in the above career with JumpFly, please send your resume and unique cover letter letting us know why you want to work with us to Careers@JumpFly.com. We will review your qualifications and contact you if there is a fit. 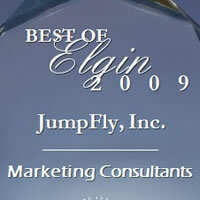 JumpFly, the top ranked Search Engine Marketing Consultants in the US, was awarded the 2009 Best of Elgin Award in the Search Engine Marketing Consultants category for the 3rd year in a row. Each year, the U.S. Commerce Association (USCA) selects outstanding local businesses they believe have achieved exceptional marketing success in their local community and business category. Only companies that enhance the positive image of small business through service to their customers and community are chosen. The USCA was established with the intention to recognize the best of local businesses in their community. The organization works exclusively with local business owners, professional associations, chambers of commerce and other business advertising and marketing groups to help promote local business activity through public relations, marketing and advertising. JumpFly was selected for the 2009 USCA Best of Local Business award in the Search Engine Marketing Consultants Category based on information gathered by the USCA and data provided by third parties. Based in the Chicago suburb of Elgin, Illinois, JumpFly has served as the leading Search Engine Marketing Consultants for small and medium businesses throughout the United States for over 10 years. 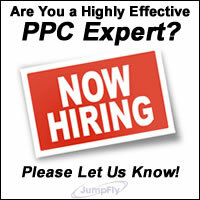 Specializing in PPC Management, JumpFly’s sole purpose is to enable its clients to maximize the results of their PPC advertising efforts while saving time and money. As proven Search Engine Marketing Consultants, JumpFly has earned several industry awards, in addition to the USCA recognition, due to its commitment to client satisfaction and successful client results. In 2009, JumpFly received an “A” grade from the Better Business Bureau and was also proudly recognized as TopSEOs’ #1 PPC Management Company in the US.